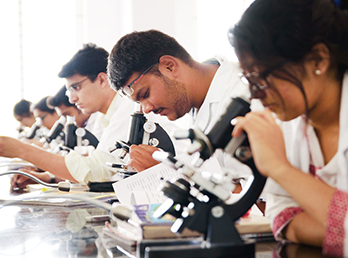 The MBBS course is affiliated to the Rajiv Gandhi University of Health Sciences (RGUHS), Karnataka. plus 1 year of compulsory rotating internship. Early exposure to research methodology and guidance from experienced faculty to encourage participation in research projects. Innovative methodology and integrated teaching. Exposure to community through Inter-Disciplinary Community Orientation Programme (IDCOP). Structured modules at the Integrated Museum. Emphasis and support to extra-curricular activities for all-round personality development. Access to a one-of-its-kind skills lab at the Ramaiah Advanced Learning Center to practice, not just observe. Yearly medical conference, “Insight” organised by undergraduate students for undergraduate students across all medical colleges in India. Global exposure through international exchange programmes with our partner Universities in Belgium, Netherlands and Australia.